I have this unfortunate habit of enjoying familiarity and challenging myself in my own big backyard, returning to the same races year after year. While I can’t complain at all about the amazing ultramarathons that are within a couple-hour drive from my house, sometimes I’m craving an altogether different experience. As running has evolved from a competitive outlet in my younger years to more of mental wellness and adventure practice in middle age, what I’m looking for in a race experience is often quite a bit different. I’m more apt to notice landscapes and flora and less phased by a fellow competitor passing me late in the race. Call it complacency, maturity, or maybe a little mellowing with age. Combining racing with traveling is my perfect fix, and I have found trail runners and ultrarunners to be the kindest people the world over. Back in January, I was invited by journalist, friend, and provocateur Gaël Couturier, a six-time Marathon des Sables finisher several-time UTMB finisher, to Greece in April for a race on the island of Corfu called the Corfu Mountain Trail. Corfu sits in the Ionian Sea off the northwest coast of Greece, nearly touching Albania. Preliminary internet browsing of this exotic destination revealed crystal-clear, teal waters and beautifully private inlets and beaches at the base of picturesque Greek villages. These villages seemed to climb up and up, into a dense canopy of jungle intermixed with olive groves. With my research on the destination and race, this opportunity stoked my typically dormant January training fire, and I started factoring long runs into my training. As the race approached, the lure of international-race travel felt absolutely exotic and led to questions that I didn’t ever think I’d need answers to. Can you fly with trekking poles? (Yes, in checked luggage.) Will I be able to find any gels or other race food in Corfu? (No, bring them in your checked luggage.) This race that was so far outside of my usual spring race schedule had injected motivation into my training, and it also gave me a beacon to focus on during a stressful few months at work. 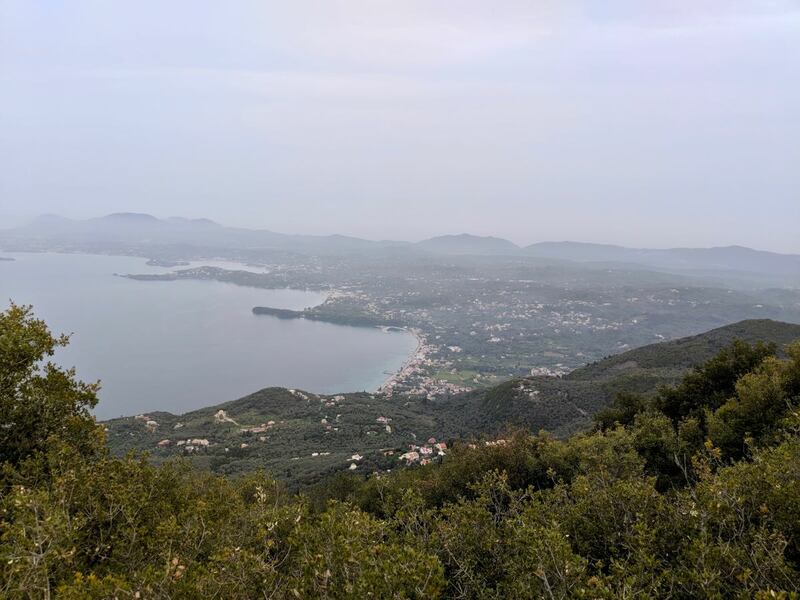 The Corfu Mountain Trail 104-kilometer race, as well as the accompanying 40k, 20k, and 8k races, were conceived by Corfu native Vasileios Alamanos five years ago as a way to showcase his beloved island and its special culture. 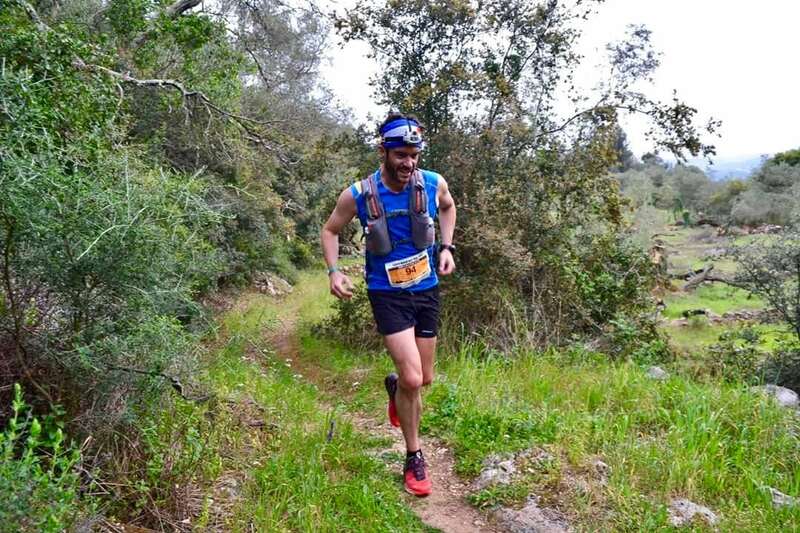 Creating a 100k race around this sickle-shaped island is no small task, and Vasileios seems to possess an encyclopedic knowledge of how to connect various trails, narrow dirt roads, and villages to create an always engaging and challenging course. 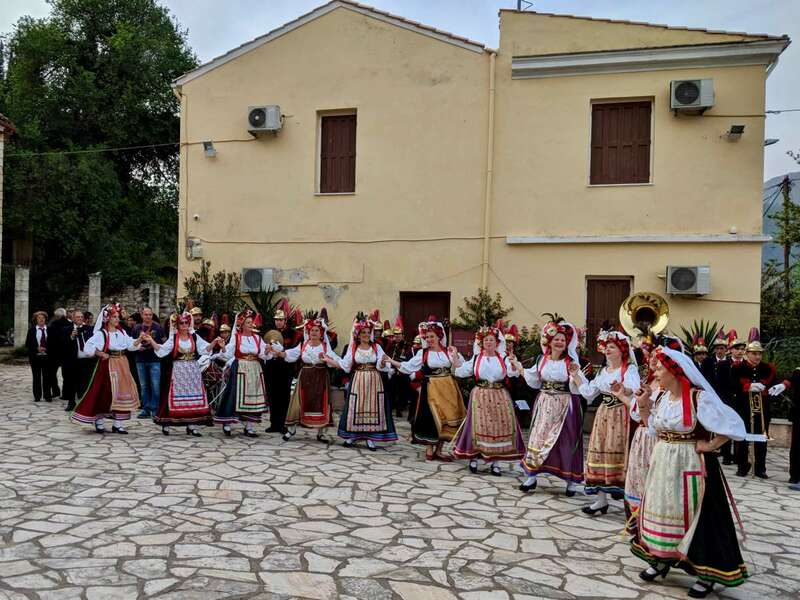 This volcanic island is dominated by Mount Pantokrator at 2,972 feet (906 meters) and as I took in the traditional Corfiot music and dance performance at the start I was intimidated by the height of this peak, for it would be our first of many climbs. Additionally, this would be my first race which started in the evening, at 7 p.m., to run through the entire night. Vasileios plans to hold the race at 5 a.m. in 2019 so that runners can experience all of the amazing island vistas in the daylight. The pre-Corfu Mountain Trail dance performance. All photos Tom Caughlan unless otherwise noted. Starting in the sleepy fishing village of Ipsos, the locals sent us off on the day’s first 3,000-foot climb. This terrain would set the tone for the remainder of the race. While we started to climb up though the village, we would abruptly turn off the road and climb past villas and up onto steep and rocky trails with dense vegetation. With the humidity at about 70 percent and the temperature sitting at 70 degrees Fahrenheit (21 degrees Celsius), I was surprised by how hot I felt despite three days of acclimatization to the humidity from the dry western United States where I live. Typical Corfu coastline scenery as seen from the first climb. As we climbed past an ancient stone monastery, the terrain flattened out into beautiful groves of trees interspersed with grassy meadows and rocks. I can only describe it as quintessentially Greek, and this terrain was some of the most charming mountain running I’ve ever experienced. As we started our descent from Pantokrator’s summit, we followed frequent flagging through a well-marked descent that felt almost like fell running through tall grass and vegetation interspersed with rocks. Running with a group of international runners donned in full compression and calf sleeves, I was severely disappointed in my choice of short socks that did nothing to dull the sharpness of the stinging nettles dotting the course over the next several hours. An ancient monastery up the first climb. As we wound up and down dirt roads around the north side of the island, I always knew we were coming into an aid station when a power line indicated a village nearby. Suddenly we’d be descending pavement down the narrowest of roads through quaint villages where smiling locals would offer all sorts of aid-station fare. In almost every aid station, I was asked where I was from, my poorly accented Greek betraying my origin, and their response to me being American was always kind. After the 50k aid station, the course really gets interesting as we made our way down to the first of four beaches we’d run across. It was amazing to run across a half mile of beach with the smell and cool wind from the sea, the only beacons being luminescent flagging and the distant headlamps of other runners. 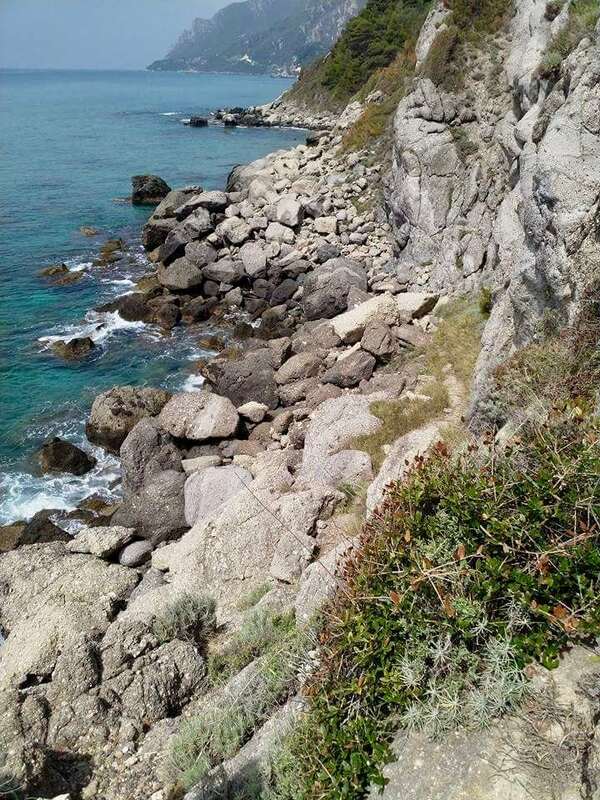 The race director, Vasileios, had warned us about a “short section where we would need to climb on some rocks to get to the next beach,” and I would consider him, like many of the Greek ultrarunners I met, understated. I soon found myself following day-glow-colored dots on giant boulders, carefully making my way while waves crashed against rocks just below me. Parts of this section involved a lot of route finding, and it ended with a brief, but low-fourth-class climb up a cliff where search-and-rescue workers were posted for safety. Exiting the final beach, I felt the end within my grasp, yet the course continued to intermix steep climbs and frustratingly runnable terrain. I’d made a cardinal error and ran too much of the first 50k hard as my mountain lungs and heart were lulled into the ease of sea-level running. Now, I was frustratingly slow as the sun rose through more beautiful villages with gracious volunteers, as well as picturesque olive groves, fruit trees, and vineyards. We descended to the beautiful village of Stavros, and now I had my bearings. I was offered the local moonshine by some older men who chided me for turning it down, but I was a mess at this point. Not even baklava, which is possibly the greatest race food ever, could salvage my effort now. Nevertheless, I was enjoying myself despite the punishing climbs I had left. Topping out for the last descent. It was also at this point that we joined runners in the 40k and 20k race distances. All were gracious to ease by me, and it was a joy to see runners from all over Europe encouraging each other. 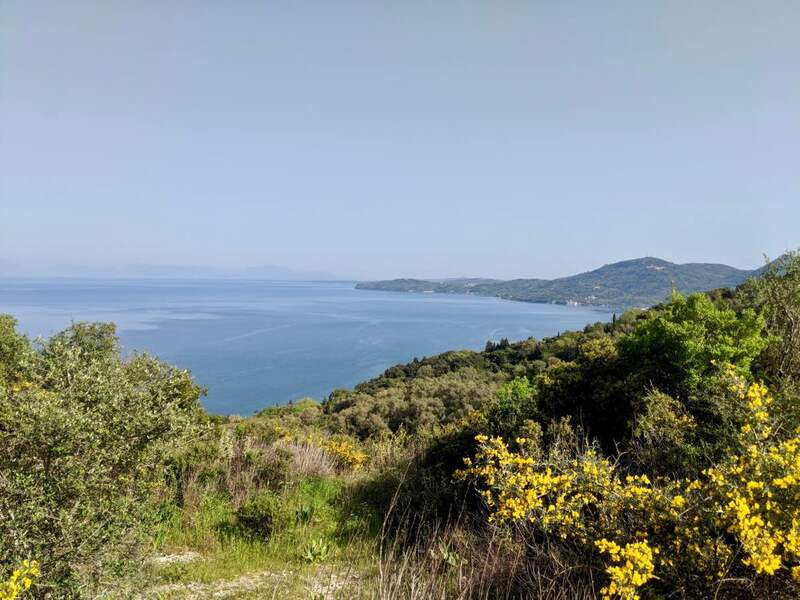 As we descended into the final village of Moraitika, I was elated to finish, next to the Ionian Sea, at the Messonghi Beach Holiday Resort which sponsored the race. The finish-line atmosphere was incredible, and food, drink, a shower, and a nap were all within 50 yards. With the race over, we spent a few days in Kérkyra, the ancient city and capital which is also known as Corfu. Greek mythology dictates that this island was named for a young woman seduced by Poseidon, and the island was a part of the Peloponnesian War. 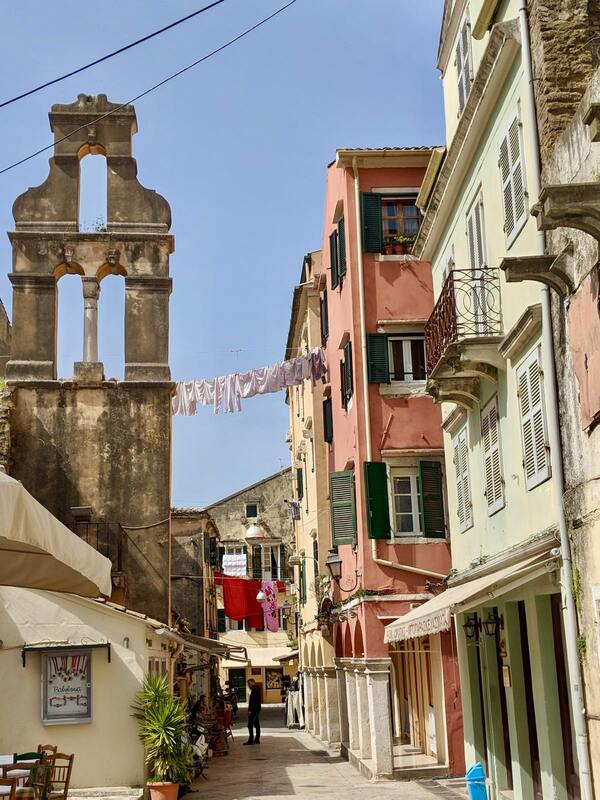 Corfu town, as it’s accepted by westerners, offered some of the most stunning architecture I’ve seen anywhere. Occupation of this island included the Byzantines, Venetians, and British, but it was the nearly 400 years of Venetian rule that truly left its mark on the island’s architecture and style. The island became home to Venetian nobility, and later welcomed the settlement of Greek intellectuals, Italian Jews, and Venetian Catholics. 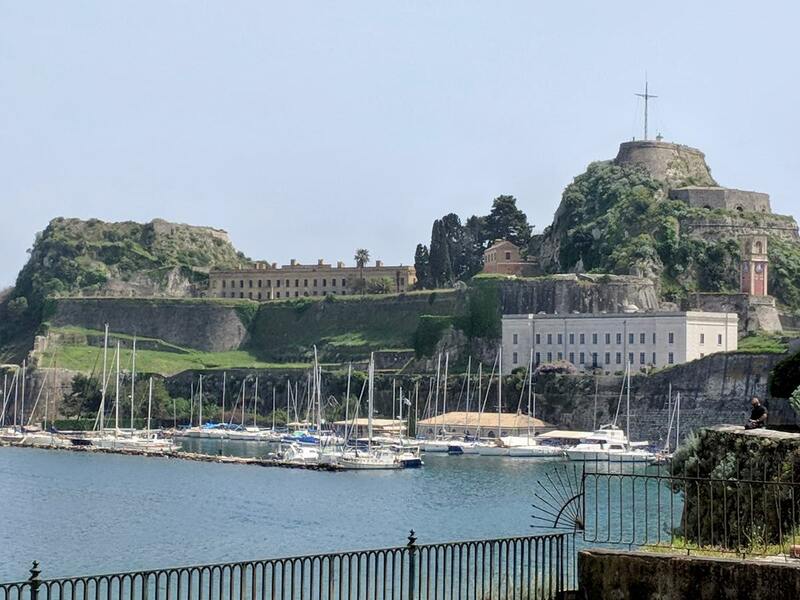 Part of what allowed these cultures to prosper, and stay safe from repeated invasions, were the strategically placed, and now beautifully ruined, castles which include two at either edge of Corfu town. A new fortress in Corfu town. This side of Greece tends to be ignored by Americans in favor of the Aegean Islands, but heavy British and French tourism seem to be indicative of all this island has to offer. I have unfinished business with this amazing race and I hope to come back for a second round. Many ultrarunners seem to separate trail racing from vacation, business from pleasure, and these things are not mutually exclusive. Finding an old-school, low-key, Greek trail race on an island was exactly what I needed at a stressful time in my life full of professional uncertainty. Sometimes we need to travel abroad to find familiarity and take comfort in our tribe of like-minded, gracious, nature-loving people. 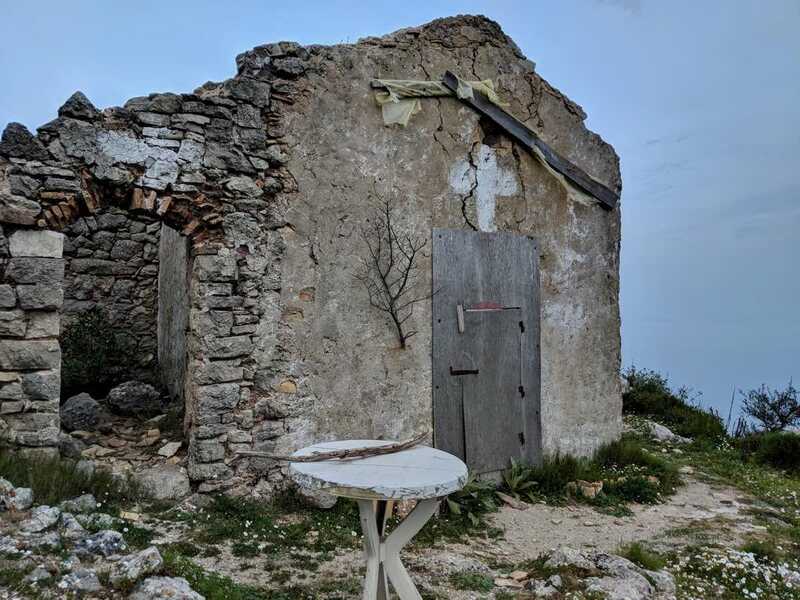 Seeing people living simply, in the mountains on a small Greek island, made coming home to a house demolished by the early stages of a remodel seem easy. I’ve been more appreciative of my own mountains and ever thankful for the ability that we all have to experience the world through running. Have you traveled to Corfu Island or participated in the Corfu Mountain Trail? Can you share your experiences? Work and play, vacation and racing, have you mixed the two and discovered that it can work for you, like Tom? Very nice write up Tom. what an amazing experience Corfu was !! !